Increasing incidence and onset at a younger age has changed the treatment strategy of diabetes mellitus (DM) towards prevention, delaying onset and minimizing disease complications. Best proven treatment strategy is to prevent the onset of disease by life style modification. Prevention of long term complications of DM is one of the greatest challenges encountered in clinical practice. An alternative and safer strategy to minimize cardiovascular complications is the need of the hour. Maintaining the blood glucose levels to the near normal range has been found to be a suitable alternative treatment strategy. Here, we discuss the concept of TGC and its effects on the cardiovascular system, starting with the available treatment modalities in diabetic patients. References for this review were identified through searches of PubMed for articles published from January, 1995, to April, 2013, by use of the terms "tight glycemic control", in combination with the term "diabetes". Relevant articles published during this period were identified through searches in the authors' personal files, in Google Scholar, and Springer Online Archives Collection. Articles resulting from these searches and relevant references cited in those articles were reviewed. Articles published in English, Italian (abstract) and Portuguese (abstract) were included. All patients with type 1 DM and many patients with type 2, especially in the advanced stages receive insulin therapy, to achieve normal or near normal glycemia. For a newly diagnosed case, oral hypoglycemic agent (OHA) is the preferred choice of drug. Metformin is the first drug of choice. Tolbutamide and chlorpropamide are prescribed among the first generation sulfonylureas (SUs); tolbutamide is considered for the initial treatment of type 2 DM, whereas use of chlorpropamide is reserved due to its long duration of action and increased episodes of hypoglycemia. Of the second generation SUs, glyburide though coupled with easy dosing schedule, its side effects notably hypoglycemia has to be kept in mind. Extra attention should be paid while prescribing this to the elderly or patients with renal complications. Use of SUs is associated with mortality (due to cardiovascular and other cause), glimepiride and glipizide resulting in higher mortality rate as compared to gliclazide. Classification of OHA is given in [Figure 1]. 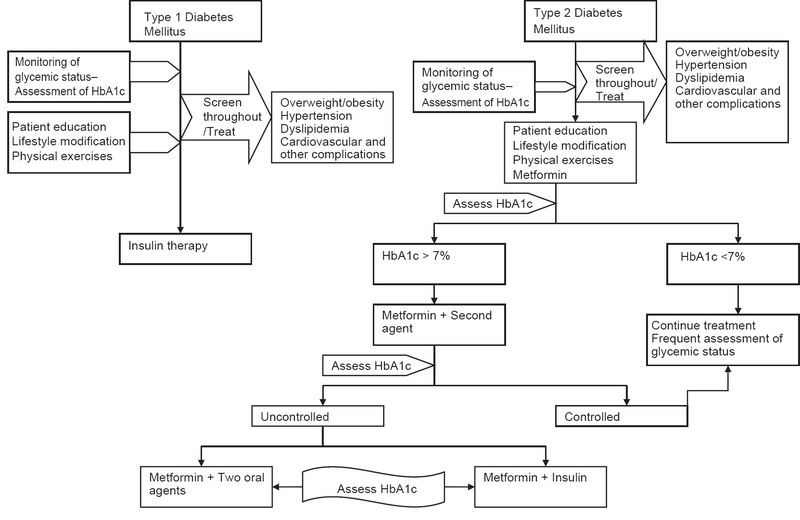 [Figure 2] outlines the management of diabetes mellitus. 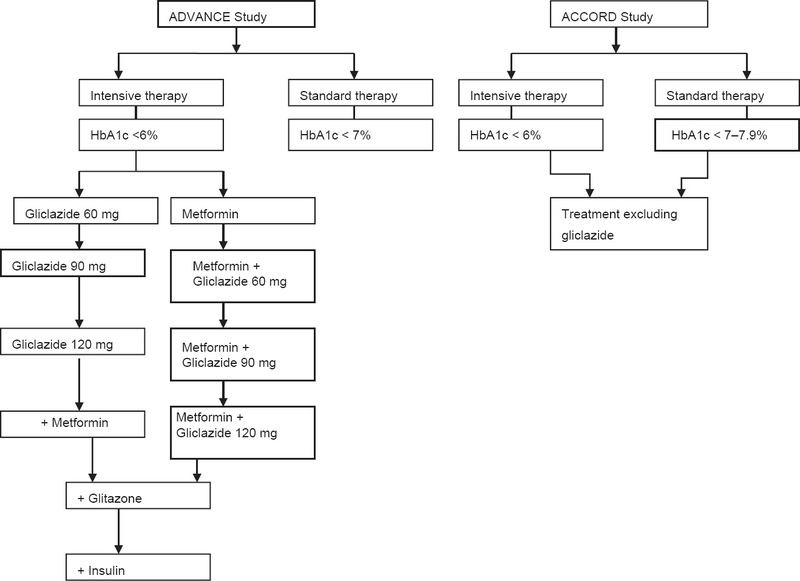 Two studies, ADVANCE  and ACCORD,  have attempted to achieve near normal glycemic control with different treatment strategies in a similar group of patients [Figure 3]. Both studies showed the treatment strategies were effective in reducing HbA1c, with a target of near normal glycosylated hemoglobin (HbA1c) level achieved in 58% in ADVANCE study and 54% in ACCORD study. Treatment strategy followed in ADVANCE study was considerably safer in terms of all cause mortality including cardiovascular ones. Severe hypoglycemia and weight gain were seen in 0.7% and 0.2%, respectively in ADVANCE study group as against 3.1% and 3.5% in ACCORD group, indicating that these two adverse events (AEs) were less with gliclazide therapy. Allogliptin is approved by the US FDA for use in type 2 DM and available as mono drug and in combination with metformin HCl and pioglitazone. Its efficacy has been studied in 14 clinical trials involving 8500 type 2 DM patients. In 26 weeks, it produced a HbA1c reduction of 0.4-0.6% compared to placebo. Berhan A et al. have analysed allogliptin's efficacy in reducing HbA1c in type 2 DM patients, in a meta-analysis, and found it to be effective. Vidagliptin is not approved for clinical use in the United States. Treatment goals in diabetic patients include achieving a near normal glycemic levels, which is considered as TGC, to minimize microvascular complications that are associated with DM. American diabetes Association recommends maintaining HbA1c levels < 7% in the majority of patients, which is achievable by maintaining fasting blood glucose between 70-130 mg/dL, postprandial levels < 180mg/dL and mean blood glucose levels between 150-160 mg/dL. Treatment focus is in identifying a suitable agent (s) for initial therapy either mono or in combination of OHAs in treatment naοve patients and for those who are less responsive to treatment. Target oriented treatment strategy is adopted currently in the management of DM, which include the management of overweight and obesity, hyperglycemia, hypertension, and dyslipidemia. One crucial missing element while considering treatment strategy is the fact hypoglycemic drugs themselves may influence CAD and therefore, should be included in the strategy. Pharmacotherapy along with lifestyle modifications and change in the diet can aid in achieving TGC in these patients, , and this can even prevent or postpone the onset of DM in pre-diabetics. In England, with available treatment, TGC with HbA1c < 6.5% is achieved only in 26.2% diabetic patients and HbA1c of > 7.5% was seen in 35% diabetic patients,  indicating the practical difficulty in achieving the near normal glycemia even in developed countries. Oral hypoglycemic agents are used either alone or along with insulin in management of type 2 DM. SUs are associated with hypoglycemia and weight gain; moreover, few SUs may increase the risk of cardiovascular events adding to the existing problem. Moreover, with SUs, near normal glycemic control is extremely difficult to achieve. There is no established evidence to prove that SUs reduce morbidity and mortality over a long period. Complex dosing schedule is another complex issue. Though TGC is the treatment goal in young patients, achieving and maintaining TGC in elderly diabetics, and those with the other end stage diseases is challenging and still controversial. These patients are more prone to have loss of appetite and TGC may lead to episode (s) of hypoglycemia. Hence, some physicians advise moderate glycemic control to maintain and enhance comfort and quality of life. However, few have a different thought on this arguing that elderly patients will have more benefit compared to younger patients. It is advisable not to reduce HbA1c levels < 7% in this population for the risk of development of hypoglycemia. Health policies should implement regulations to reduce the burden cost of developing disease complications. Screening strategy should be adopted to identify the disease in pre diabetic state and aim at postponing or preventing the onset of frank DM. Diabetic patients should be screened for the development and progression of disease complications, especially those with myocardial damage, left ventricular dysfunction. Moreover, pharmacoeconomic studies indicate that by maintaining TGC in diabetic patients is highly cost effective in terms of reduced mortality, mortality, hospital cost,  thus have a significant effect on the economic burden on individual as well on the country. Recent observations suggest that selectivity of sulfonylurea determines cardiovascular safety. Among sulfonylurea, newer agent, gliclazide is preferable in terms of efficacy, long term vascular benefits, and minimal risk of hypoglycemia and weight gain. Gliptins though appear to be promising agents, their long term safety and efficacy is yet to be proved by more population based studies. We advocate better patient education, active participation and involvement for better clinical outcome; despite the availability of various treatment protocols, treatment priorities should be individualized so that quality of life is not affected in these patients. As there are many patients in pre diabetic stage, regular screening is required to identify them at initial stages of disease to minimize disease complications. Gaede P, Vedel P, Larsen N, Jensen GV, Parving HH, Pedersen O. Multifactorial intervention and cardiovascular disease in patients with type 2 diabetes. N Engl J Med 2003;348:383-93. Gotto AM Jr. Cardiologist′s role in improving glucose control and global cardiovascular risk in patients with type 2 diabetes mellitus. Am J Cardiol 2007;99:3B-5B. Juurlink DN, Gomes T, Lipscombe LL, Austin PC, Hux JE, Mamdani MM. Adverse cardiovascular events during treatment with pioglitazone and rosiglitazone: Population based cohort study. BMJ 2009;339:b2942. Graham DJ, Ouellet-Hellstrom R, MaCurdy TE, Ali F, Sholley C, Worrall C, et al. Risk of acute myocardial infarction, stroke, heart failure, and death in elderly Medicare patients treated with rosiglitazone or pioglitazone. JAMA 2010;304:411-8. Dormandy JA, Charbonnel B, Eckland DJ, Erdmann E, Massi-Benedetti M, Moules IK, et al., PROactive investigators. Secondary prevention of macrovascular events in patients with type 2 diabetes in the PROactive Study (PROspective pioglitAzone Clinical Trial In macroVascular Events): A randomised controlled trial. Lancet 2005;366:1279-89. American Diabetes Association. Standards of Medical Care in Diabetes-2013. Diabetes Care 2013;36 Suppl 1:S11-66. Schramm TK, Gislason GH, Vaag A, Rasmussen JN, Folke F, Hansen ML, et al. Mortality and cardiovascular risk associated with different insulin secretagogues compared with metformin in type 2 diabetes, with or without a previous myocardial infarction: A nationwide study. Eur Heart J 2011;32:1900-8. Heller S, ADVANCE Collaborative Group. A summary of the ADVANCE trial. Diabetes Care 2009;32:357-S61. The Action to Control Cardiovascular Risk in Diabetes Study Group, Gerstein HC, Miller ME, Byington RP, Goff DC Jr, Bigger JT, Buse JB, et al. Effects of Intensive Glucose Lowering in Type 2 Diabetes. N Engl J Med 2008; 358:2545-59. Elhadd TA, Ghosh S, Collier A, Ahmed AE. Advances in pharmacotherapy of Type 2 diabetes (Part-3: The gliptins). Sudan Med J 2010;46:65-72. Scheen AJ, Paquot N. Gliptin versus a sulphonylurea as add-on to metformin. Lancet 2012;380:450-2. FDA News release. US FDA updated 28 Jan 2013. Available from http://www.fda.gov/NewsEvents/Newsroom/PressAnnouncements/ucm336942.htm [Last accessed on 2013 Apr 01]. Berhan A, Berhan Y. Efficacy of alogliptin in type 2 diabetes treatment: A meta-analysis of randomized double-blind controlled studies. BMC Endocr Disord 2013;13:9. Clement M, Bhattacharya O, Conway JR. Is tight glycemic control in type 2 diabetes really worthwhile? Yes. Can Fam Physician 2009;55:580-8. Scalea TM, Bochicchio GV, Bochicchio KM, Johnson SB, Joshi M, Pyle A. Tight glycemic control in critically injured trauma patients. Ann Surg 2007;246:605-10. Krinsley JS. Glycemic control, diabetic status, and mortality in a heterogeneous population of critically ill patients before and during the era of intensive glycemic management: Six and one-half years experience at a university-affiliated community hospital. Semin Thorac Cardiovasc Surg 2006;18:317-25. Schellhase KG, Koepsell TD, Weiss NS. Glycemic control and the risk of multiple microvascular diabetic complications. Fam Med 2005;37:125-30. Savioli M, Cugno M, Polli F, Taccone P, Bellani G, Spanu P, et al. Tight glycemic control may favor fibrinolysis in patients with sepsis. Crit Care Med 2009;37:424-31. Fatim J, Karoli R, Chandra A, Naqvi N. Attitudinal determinants of fasting in type 2 diabetes mellitus patients during Ramadan. J Assoc Physicians India 2011;59:630-4. Hui E, Devendra D. Diabetes and fasting during Ramadan. Diabetes Metab Res Rev 2010;26:606-10. Zargar AH, Siraj M, Jawa AA, Hasan M, Mahtab H. Maintenance of glycaemic control with the evening administration of a long acting sulphonylurea in male type 2 diabetic patients undertaking the Ramadan fast. Int J Clin Pract 2010;64:1090-4. Bashir MI, Pathan MF, Raza SA, Ahmad J, Khan AK, Ishtiaq O, et al. Role of oral hypoglycemic agents in the management of type 2 diabetes mellitus during Ramadan. Indian J Endocrinol Metab 2012;16:503-7. Ahmed MH, Abdu TA. Diabetes and Ramadan: An update on use of glycemic therapies during fasting. Ann Saudi Med 2011;31:402-6. Velayudhan M. Managing diabetes during the Muslim fasting month of Ramadan. Med J Malaysia 2012;67:353-5. Cherian B, Meka N, Katragadda S, Arora R. Therapeutic implications of diabetes in cardiovascular disease. Am J Ther 2009;16:e51-9. Bi Y, Zhu D, Cheng J, Zhu Y, Xu N, Cui S, et al. The status of glycemic control: A cross-sectional study of outpatients with type 2 diabetes mellitus across primary, secondary, and tertiary hospitals in the Jiangsu province of China. Clin Ther 2010;32:973-83. Tarantini L, Di Lenarda A, Velussi M, Faggiano P, Comaschi M, Faglia E, et al. Diabetes mellitus, left ventricular dysfunction and congestive heart failure. Ital Heart J Suppl 2004;5:605-15. Piccini JP, Klein L, Gheorghiade M, Bonow RO. New insights into diastolic heart failure: Role of diabetes mellitus. Am J Med 2004;116 Suppl 5A: 64-75S. Marfella R, Sasso FC, Cacciapuoti F, Portoghese M, Rizzo MR, Siniscalchi M, et al. Tight glycemic control may increase regenerative potential of myocardium during acute infarction. J Clin Endocrinol Metab 2012;97:933-42. Marfella R, Di Filippo C, Portoghese M, Ferraraccio F, Rizzo MR, Siniscalchi M, et al. Tight glycemic control reduces heart inflammation and remodeling during acute myocardial infarction in hyperglycemic patients. J Am Coll Cardiol 2009;53:1425-36. Tandon N, Ali MK, Narayan KM. Pharmacologic prevention of microvascular and macrovascular complications in diabetes mellitus: Implications of the results of recent clinical trials in type 2 diabetes. Am J Cardiovasc Drugs 2012;12:7-22. Weiss IA, Valiquette G, Schwarcz M. Impact of glycemic treatment choices on cardiovascular complications in type 2 diabetes. Cardiol Rev 2009;17:165-75. Lazar HL, Chipkin SR, Fitzgerald CA, Bao Y, Cabral H, Apstein CS. Tight glycemic control in diabetic coronary artery bypass graft patients improves perioperative outcomes and decreases recurrent ischemic events. Circulation 2004;109:1497-502. Brown JR, Furnary AP, Mackenzie TA, Duquette D, Helm RE, Paliotta M, et al., Northern New England Cardiovascular Disease Study Group. Does tight glucose control prevent myocardial injury and inflammation? J Extra Corpor Technol 2011;43:144-52. Drechsler C, Krane V, Ritz E, März W, Wanner C. Glycemic control and cardiovascular events in diabetic hemodialysis patients. Circulation 2009;120:2421-8. Kruyt ND, Biessels GJ, Devries JH, Roos YB. Hyperglycemia in acute ischemic stroke: Pathophysiology and clinical management. Nat Rev Neurol 2010;6:145-55. Sawicki PT, Bender R, Berger M, Mühlhauser I. Non-linear effects of blood pressure and glycosylated haemoglobin on progression of diabetic nephropathy. J Intern Med 2000;247:131-8. Fioretto P, Bruseghin M, Berto I, Gallina P, Manzato E, Mussap M. Renal protection in diabetes: role of glycemic control. J Am Soc Nephrol 2006;17:S86-9. Park L, Wexler D. Update in diabetes and cardiovascular disease: Synthesizing the evidence from recent trials of glycemic control to prevent cardiovascular disease. Curr Opin Lipidol 2010;21:8-14. Thomaseth K, Pacini G, Morelli P, Tonolo G, Nosadini R. Importance of glycemic control on the course of glomerular filtration rate in type 2 diabetes with hypertension and microalbuminuria under tight blood pressure control. Nutr Metab Cardiovasc Dis 2008;18:632-8. Hamaguchi E, Takamura T, Sakurai M, Mizukoshi E, Zen Y, Takeshita Y, et al. Histological course of nonalcoholic fatty liver disease in Japanese patients: Tight glycemic control, rather than weight reduction, ameliorates liver fibrosis. Diabetes Care 2010;33:284-6. Mesotten D, Wauters J, Van den Berghe G, Wouters P, Milants I, Wilmer A. The effect of strict blood glucose control on biliary sludge and cholestasis in critically ill patients. J Clin Endocrinol Metab 2009;94:2345-52. Raman R, Gupta A, Kulothungan V, Sharma T. Prevalence and risk factors of diabetic retinopathy in subjects with suboptimal glycemic, blood pressure and lipid control. Sankara Nethralaya Diabetic Retinopathy Epidemiology and Molecular Genetic Study (SN-DREAMS, Report 33). Curr Eye Res 2012;37:513-23. The relationship of glycemic exposure (HbA1c) to the risk of development and progression of retinopathy in the diabetes control and complications trial. Diabetes 1995;44:968-83. Shorr RI, de Rekeneire N, Resnick HE, Yaffe K, Somes GW, Kanaya AM, et al. Glycemia and cognitive function in older adults using glucose-lowering drugs. J Nutr Health Aging 2006;10:297-301. Steil GM, Langer M, Jaeger K, Alexander J, Gaies M, Agus MS. Value of continuous glucose monitoring for minimizing severe hypoglycemia during tight glycemic control. Pediatr Crit Care Med 2011;12:643-8. Puar TH, Khoo JJ, Cho LW, Xu Y, Chen YT, Chuo AM, et al. Association between glycemic control and hip fracture. J Am Geriatr Soc 2012;60:1493-7. Egi M, Finfer S, Bellomo R. Glycemic control in the ICU. Chest 2011;140:212-20. Reeds D. Near-normal glycemia for critically ill patients receiving nutrition support: Fact or folly. Curr Opin Gastroenterol 2010;26:152-5. Siegelaar SE, Devries JH, Hoekstra JB. Patients with diabetes in the intensive care unit; not served by treatment, yet protected? Crit Care 2010;14:126. Bhamidipati CM, LaPar DJ, Stukenborg GJ, Morrison CC, Kern JA, Kron IL, et al. Superiority of moderate control of hyperglycemia to tight control in patients undergoing coronary artery bypass grafting. J Thorac Cardiovasc Surg 2011;141:543-51. Leibowitz G, Raizman E, Brezis M, Glaser B, Raz I, Shapira O. Effects of moderate intensity glycemic control after cardiac surgery. Ann Thorac Surg 2010;90:1825-32. Dokun AO. Lessons learned from glycemia control studies. Curr Diab Rep 2010;10:133-8. Kovalaske MA, Gandhi GY. Glycemic control in the medical intensive care unit. J Diabetes Sci Technol 2009;3:1330-41. Wiener RS, Wiener DC, Larson RJ. Benefits and risks of tight glucose control in critically ill adults: A meta-analysis. JAMA 2008;300:933-44. Chen LK, Chen YM, Lin MH, Peng LN, Hwang S. Care of elderly patients with diabetes mellitus: A focus on frailty. Ageing Res Rev 2010;9 Suppl 1:S18-22. Marik PE, Preiser JC. Toward understanding tight glycemic control in the ICU: A systematic review and metaanalysis. Chest 2010;137:544-51. Wilson G, Perry T. Is tight glycemic control in type 2 diabetes really worthwhile? NO. Can Fam Physician 2009;55:581, 583, 585, 587, 588. Hanazaki K, Maeda H, Okabayashi T. Tight perioperative glycemic control using an artificial endocrine pancreas. Surg Today 2010;40:1-7. Hanazaki K, Maeda H, Okabayashi T. Relationship between perioperative glycemic control and postoperative infections. World J Gastroenterol 2009;15:4122-4125. Rogers S, Ramos M. Tight glycemic control using an artificial pancreas to control perioperative hyperglycemia decreases surgical site infection in pancreatectomized or hepatectomized patients. Ann Surg 2009;250:351-2. LeRoith D, Rayfield EJ. The benefits of tight glycemic control in type 2 diabetes mellitus. Clin Cornerstone 2007;8 Suppl 7:S19-29. Silva FM, Steemburgo T, Azevedo MJ, Mello VD. Glycemic index and glycemic load in the prevention and treatment of type 2 diabetes mellitus. Arq Bras Endocrinol Metabol 2009;53:560-71. National Diabetes Audit 2010-2011 Report 1: Care Processes and Treatment Targets. Findings about the quality of care for people with diabetes in England and Wales Report for the audit period 2010-2011. Available from http://www.hqip.org.uk/assets/NCAPOP-Library/NCAPOP-2012-13/Diabetes-Audit-Report-2010-11-Care-Process-and-Treatment-Targets-published-2012.pdf [Last accessed on 2013 Apr 02]. Furukawa S, Kumagi T, Miyake T, Ueda T, Niiya T, Nishino K, et al. Suicide attempt by an overdose of sitagliptin, an oral hypoglycemic agent: A case report and a review of the literature. Endocr J 2012;59:329-33. Information for Healthcare Professionals-Acute pancreatitis and sitagliptin (marketed as Januvia and Janumet). Drugs. US FDA. Available from http://www.fda.gov/Drugs/....ucm183764.htm [Last accessed on 2013 Apr 01]. Dore DD, Bloomgren GL, Wenten M, Hoffman C, Clifford CR, Quinn SG, et al. A cohort study of acute pancreatitis in relation to exenatide use. Diabetes Obes Metab 2011;13:559-66. Tice MA. Diabetes management at the end of life: Transitioning from tight glycemic control to comfort. Home Healthc Nurse 2006;24:290-3. Chin TL, Sauaia A, Moore EE, Chandler JG, Harr JN, Johnson JL, et al. Elderly patients may benefit from tight glucose control. Surgery 2012;152:315-21. Triplitt C. Cardiac risk factors and hypoglycemia in an elderly patient: How good is good enough? Consult Pharm 2010;25 Suppl B: 19-27. Cheng AY, Leiter LA. Glucose lowering and cardiovascular disease: What do we know and what should we do? Eur J Cardiovasc Prev Rehabil 2010;17:S25-31. Bianchi C, Penno G, Miccoli R, Del Prato S. Blood glucose control and coronary heart disease. Blood glucose control and coronary heart disease. Herz 2010;35:148-59. Hilleman DE. Cost considerations with tight glycemic control in the acute care setting. Semin Thorac Cardiovasc Surg 2006;18:359-65.